So inevitably one has to ask; are there other examples? Well, during the annual updating of my own lecture notes on pericyclic reactions, I had decided to revisit a fascinating reaction, which we had first looked at years ago (below). Let us focus specifically on the last reaction, which involves cyclization of a  annulene. The pedagogic interest was to challenge the students as to whether this was a π4+π2 cycloaddition, or two 6-electron electrocyclizations. 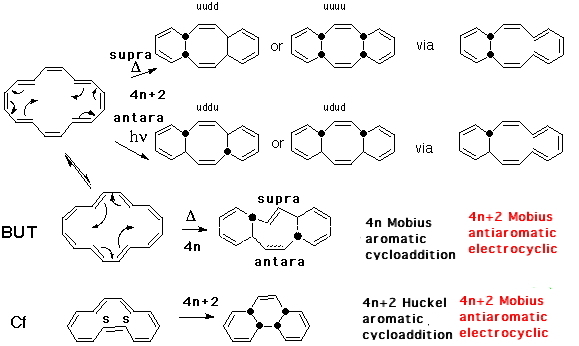 The answer of course was that either way of considering this reaction was equally valid, and both modes were presumed to proceed via Hückel-aromatic transition states. I had said as such in my lectures for many years. This year, I finally decided to evaluate the NICS index to verify this long stated hypothesis. NICS is a magnetic index which yields a negative value (of -10 to -16 ppm) for aromatic rings, and positive values for antiaromatic rings. I was fully expecting to get negative values for all three rings at the transition state. Of course, this result was not obtained! Instead, whilst the central ring did have a negative value (of -16.4 ppm), the two outer rings had the initially mystifying value of +4.8! In other words they were antiaromatic. The electron count was in no doubt, ie 4n+2 (six). The transition state stereochemistry was clearly disrotatory. But the resulting transition state ring was antiaromatic and not aromatic! Well, close (and this is why it helps to have models) inspection reveals that despite the disrotation, the bond which is being formed actually does so antarafacially, and that the topology of this transition state is actually Möbius and not Hückel. A little more thought reveals that a thermal Möbius transition state with 4n+2 electrons must be antiaromatic. So we conclude by saying that a second example of how a disrotatory reaction can actually have Möbius character has now been revealed. Unlike the example shown by Mauksch and Tsogoeva, this Möbius transition state is actually anti-aromatic, the first example of such which has been postulated. That the disrotatory mode is not the fundamental here is shown by the alternative exo isomer of this transition state. The antarafacial nature of the bond formation is retained, but now the disrotation is replaced by conrotation. The two electrocyclic rings however retain their anti-aromaticity. Notice also how for both the examples, the bond lengths in the aromatic central ring are fully delocalized (equalized), whereas for the two outside rings, they are full localized (with long and short bond lengths). These two properties are of course characteristic for aromatic and antiaromatic rings. Let’s also take a look at the example preceeding the  annulene, which is the analogous reaction of a  annulene. This reaction takes the phenomenon one stage further. The central ring is formed by a π4a + π4s cycloaddition via a Möbius aromatic transition state, whilst the two outer rings are again Möbius antiaromatic transition states, but now with conventional conrotation rather than disrotation. Oh, there are other reactions in the above scheme. They, it turns out, are equally fascinating. But I will leave analysis of that to another day. This entry was posted on Thursday, April 2nd, 2009 at 2:57 pm and is filed under Interesting chemistry. You can follow any responses to this entry through the RSS 2.0 feed. You can leave a response, or trackback from your own site.